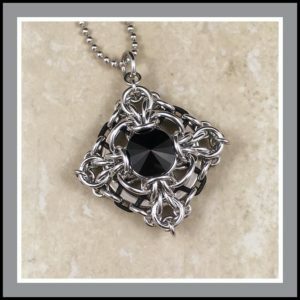 Diamonte is an intermediate chainmaille designed and taught by Leayn Tabili of Anthelion Jewelry, created with bright aluminum jump rings, rubber rings, and Swarovski crystals. Prior knowledge of basic chainmaille required, along with the dexterity to work with a pair of pliers to open and close jump rings woven into very tight spaces. This pendant will be finished in class. $20, supplies not included – Kit fee is $15 with crystal or $10 without crystal (crystals may be purchased from Funky’s).